Getting even a glimpse of the Great Indian Hornbill is a great experience filled with excitement and joy. It is such a big and colorful bird. The scientific name of the bird is Buceros bicornis. In India, it is seen in the Sahyadri (western ghats) regions of the south and the forests of north-eastern states. 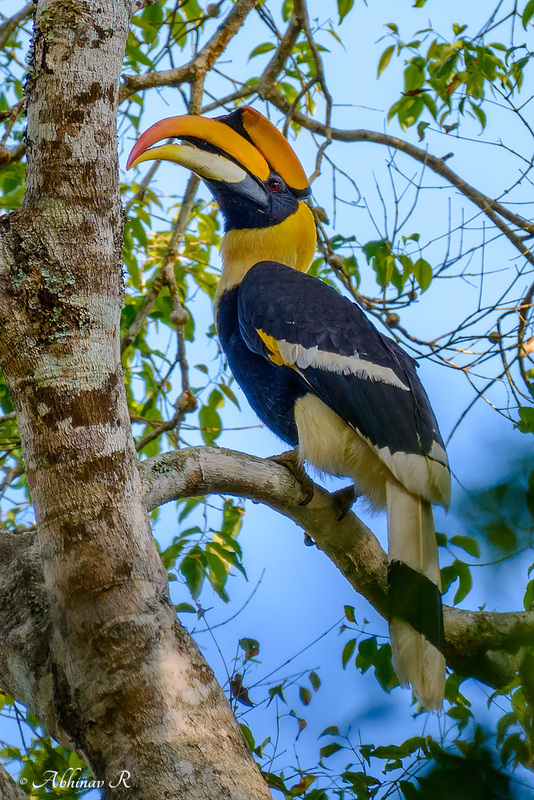 Like some of the other hornbill species of India, it is also facing the threat of population decline, mainly due to habitat loss – emphasizing the importance of conservation. According to IUCN, its status is Near Threatened. Great Hornbill is also the State Bird of Kerala. 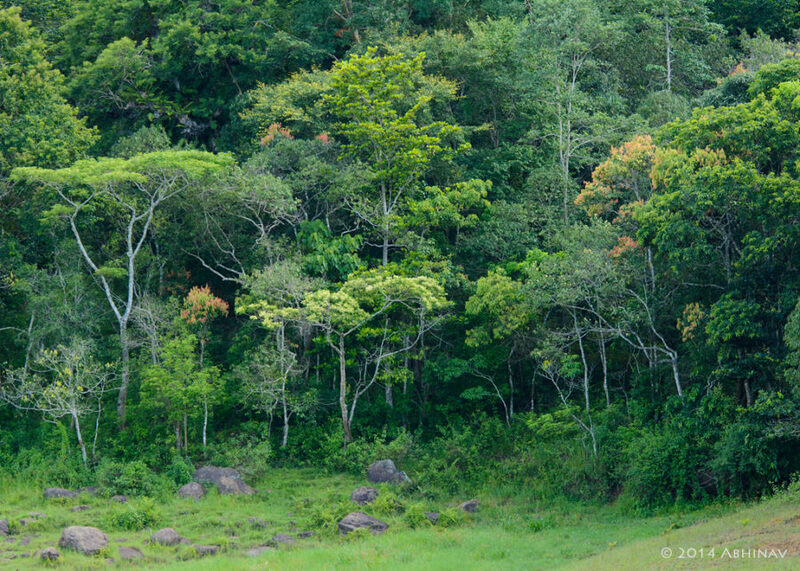 I clicked the above photo from Periyar Tiger Reserve in Idukki, Kerala. There was a pair – male and female. The image is that of the male. As our guide told us, birdwatchers usually search and wait for several days for this bird, to get a glimpse of it. However, we were lucky to see it unexpectedly during the morning bird watching inside the park. We started hearing the loud wing-flaps approaching us. In a matter of seconds, they perched on a branch above us. They were directly over us on a tall tree. Still, we couldn’t get a clear view because of the lower tree cover. So couldn’t click a good photo. Got only a glimpse, which itself was a big thing. Once again we heard the flaps as they started moving away. To our surprise, they took a halt to perch on another tree not far away. I think it was at least 50 meters away from us, at about 30 meters from the ground. We too followed silently without making any disturbance. This time the male bird was clearly in sight through a gap between the tree branches. My camera started clicking in burst mode. The female was still behind the leaves, hidden from our view. The birds spent only a few seconds and finally flew away. Guide told us that the pair might be searching for a nesting place, as the nesting season was approaching. It was the second time I had seen this bird. The previous sighting was also from Periyar. Great Indian Hornbill is the state bird of Kerala and Arunachal Pradesh. The exact reason why it is selected as the state bird is not known. However, conservational importance can be a reason. Also, hornbill’s peculiar nesting procedure and family orientedness are noteworthy. In the local language Malayalam, it is known as ‘Mala Muzhakki Vezhambal’, meaning ‘Hornbill which resounds the hills’. The name is apt. It’s high amplitude wing flaps and calls can be heard at a very long distance. Its calls are like huge ‘oogh–oogh‘ and wing flaps like ‘oosh-oosh’. Size wise it is about 1.5 meters long, with a wing span of about 1.3 meters. Males are larger and have eyes red in color. Females have blue-yellow colored eyes. There is a hollow orange-yellow cap/casque on the head which is noteworthy. The upper mandible is orange and lower mandible off-white. The face region is black. The neck is yellow colored. Wings and abdomen are primarily black. Wings have a white lining in the middle and at the tips. Lower body and tail are white with tail having a black stripe. These are some of the noticeable characteristics of the bird. The nesting period is from March-April onward, which lasts for about six months. During this time sighting is comparatively difficult. The male bird feeds the whole family. Female will be inside the nest. After this nesting time, the female comes out and joins the male for collecting food for the family. Chicks will remain inside the nest for a few more weeks until they can find their food themselves. Apart from India, this beautiful bird is seen in some of the other south and south-east Asian countries. But in all these places, loss of habitat and population decline is the concern. To preserve these beauties, preserving the tropical evergreen forests of the region is the way. They want vast stretches of forests to live. Not just fragmented forests. Many species of large evergreen trees are dependent on this bird and vice versa. ‘Akil‘ (in the Malayalam language) is one of them. Dysoxylum malabaricum is probably its botanical name. Only a bird like a hornbill can break this trees’ hard fruit. And they leave the seeds in the soil to germinate. So both are interdependent. So once again, we should preserve our evergreen forests. Nice article for bird lovers like me.